The Theft of a Decade is a contrarian, revelatory analysis of how one generation pulled the rug out from under another, and the myriad consequences that has set in store for all of us. The millennial generation was the unfortunate victim of several generations of economic theories that made life harder for them than it was for their grandparents. Then came the crash of 2008, and the Boomer generation's reaction to it was brutal: politicians and policy makers made deliberate decisions that favored the interests of the Boomer generation over their heirs, the most egregious being over the use of monetary policy, fiscal policy and regulation. For the first time in recent history, policy makers gave up on investing for the future and instead mortgaged that future to pay for the ugly economic sins of the present. This book describes a new economic crisis, a sinister tectonic shift that is stealing a generation's future. I first want the author, Joseph Sternberg, to know that I probably highlighted half of his book. A seemingly fair approach to the issue of how Millennials have been hamstrung in terms of the job market and various policies (Sternberg identifies as a conservative several times in his work). There are pros and cons given to several administrations, and, while some of his statements could be construed as too clinical (there's a suggestion to overtake the green belt section of London to allow for more housing in one chapter), it's only to serve a finer point: That, given the current situation and the current path taken, this generation might have to choose which hill they want to die on. Great care appears to have been taken toward the front to lay out precisely how we reached this point, why the Boomers have possibly behaved the way they have (in a fiscal sense), and then there's the dive into just how screwed Millennials are. Stats upon stats upon stats are heaved onto the pages, lest the reader think that Sternberg came ill-prepared. There's frequent pauses to remind that we shouldn't directly vilify the Boomer generation, as some of these measures were borne of thoughtlessness for the future (e.g. to address hot-button issues, kick "cans" down the road), but examples steeped in greed are easy to spot (I'd like to think that Sternberg put a bow on some of them to earmark it for your reading pleasure, if he didn't express his opinion directly). 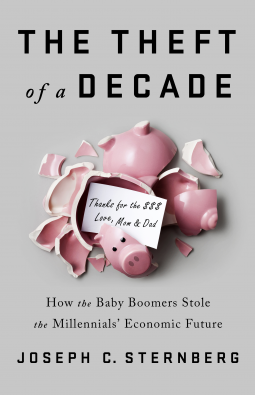 As the Millennial generation, according to this book, are experiencing a stunted growth due to restricted job opportunities, uneven reward (or even punishment) for pursuing higher education and the debt that accompanies it, choked-up housing markets, and being footed a bill to take care of the aging Boomers (who are greater in numbers, less healthy (i.e. higher health costs), and retiring pretty soon, if not already), we're given a lot to ruminate on. As I admittedly to not know nearly enough to think of any rebuttal to any of the issues, I would be interested in hearing the flip-side of this conversation; at any rate, there's an incredible amount of information in here that's great to absorb. Many thanks to NetGalley, Perseus Books, and PublicAffairs for the advance read.